The Arctic is set to become a lush and green landscape due to global warming, researchers have predicted. Experts say the wooded areas in the region could increase by 50% over the coming decades – and accelerate global warming in the process. Researchers have unveiled the most accurate map ever of how vegetation could change in the region. ‘Such widespread redistribution of Arctic vegetation would have impacts that reverberate through the global ecosystem,’ said Richard Pearson, lead author on the paper and a research scientist at the American Museum of Natural History’s Center for Biodiversity and Conservation. In a paper published on March 31 in Nature Climate Change, scientists reveal new models projecting that wooded areas in the Arctic could increase by as much as 50 percent over the next few decades. The research team—which includes scientists from the Museum, AT&T Labs-Research, Woods Hole Research Center, Colgate University, Cornell University, and the University of York—used climate scenarios for the 2050s to predict how this trend is likely to continue in the future. The scientists developed models that statistically predict the types of plants that could grow under certain temperatures and precipitation. 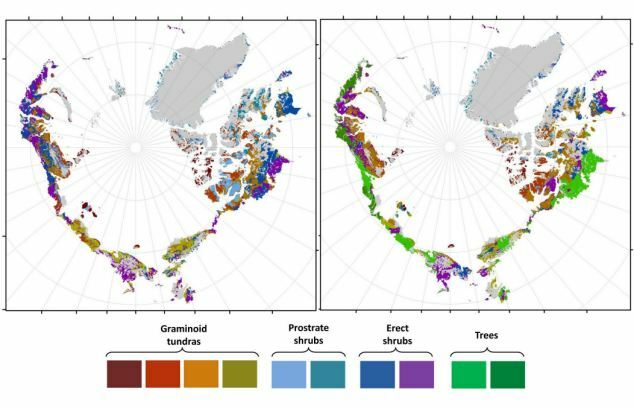 It shows the potential for massive redistribution of vegetation across the Arctic, with about half of all vegetation switching to a different class and a massive increase in tree cover. Experts say in Siberia, for instance, trees could grow hundreds of miles north of the present tree line. ‘These impacts would extend far beyond the Arctic region,’ Pearson said. In addition, the researchers investigated the multiple climate change feedbacks that greening would produce. 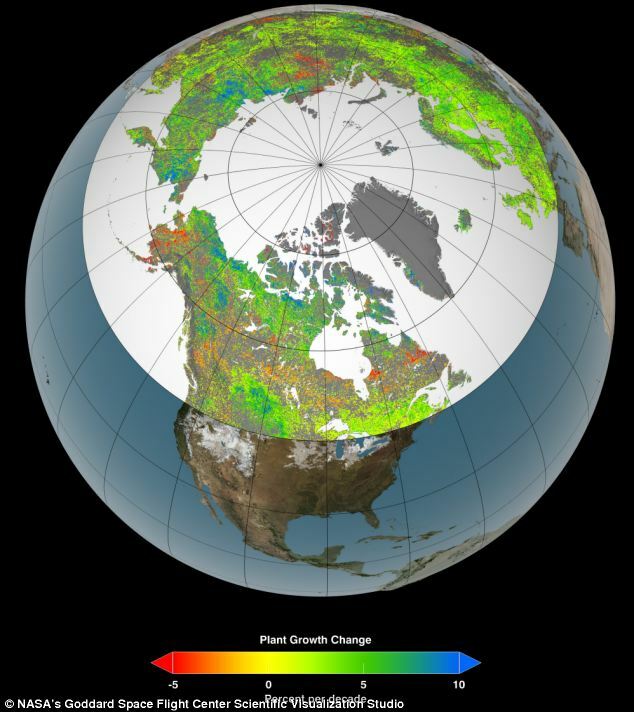 Changing colour of the Arctic: The area highlighted in white represents 10 million square miles (26 million square kilometers) of northern vegetated lands and up to 41 percent showed increases in plant growth, represented by the colours green and blue. Up to 5 percent showed decreases in plant growth, represented by orange and red. The colour changes are over the past 30 years. 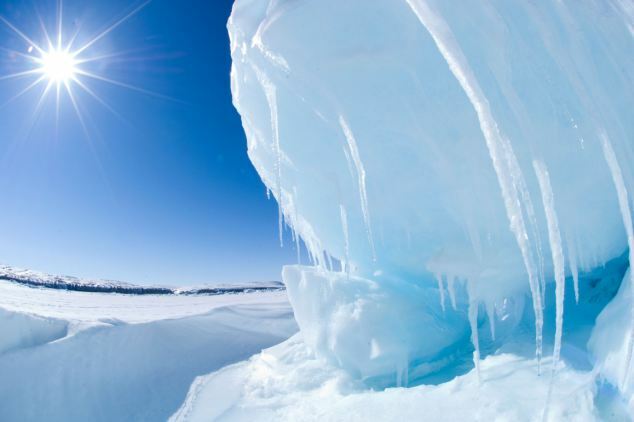 They found that a phenomenon called the albedo effect, based on the reflectivity of the Earth’s surface, would have the greatest impact on the Arctic’s climate. When the sun hits snow, most of the radiation is reflected back to space. But when it hits an area that’s ‘dark,’ or covered in trees or shrubs, more sunlight is absorbed in the area and temperature increases. This adds to the global warming problem. ‘By incorporating observed relationships between plants and albedo, we show that vegetation distribution shifts will result in an overall positive feedback to climate that is likely to cause greater warming than has previously been predicted,’ said co-author Scott Goetz, of the Woods Hole Research Center. Earlier this month shocking new images revealed by Nasa show the Arctic is becoming lusher and greener as temperatures rise. ‘Vegetation growth at Earth’s northern latitudes increasingly resembles lusher latitudes to the south’ the agency said after releasing a new study based on a 30-year record of land surface and newly improved satellite data sets.